Introduction: NOTES is an evolving field in minimally invasive surgery. This review quantifies the published NOTES experience to date and reports the most common techniques for access, dissection, extraction, and closure. Methods: We performed a search of the MEDLINE database using PubMed for all articles describing human NOTES cases. Articles providing a technical description of the procedures were included for review. We excluded cases limited to peritoneoscopy, specimen extraction, translumenal pseudocyst drainage, and gynecological procedures. Two reviewers systematically cataloged the technical details of each procedure to calculate the overall frequency of instrument use in each type of case. 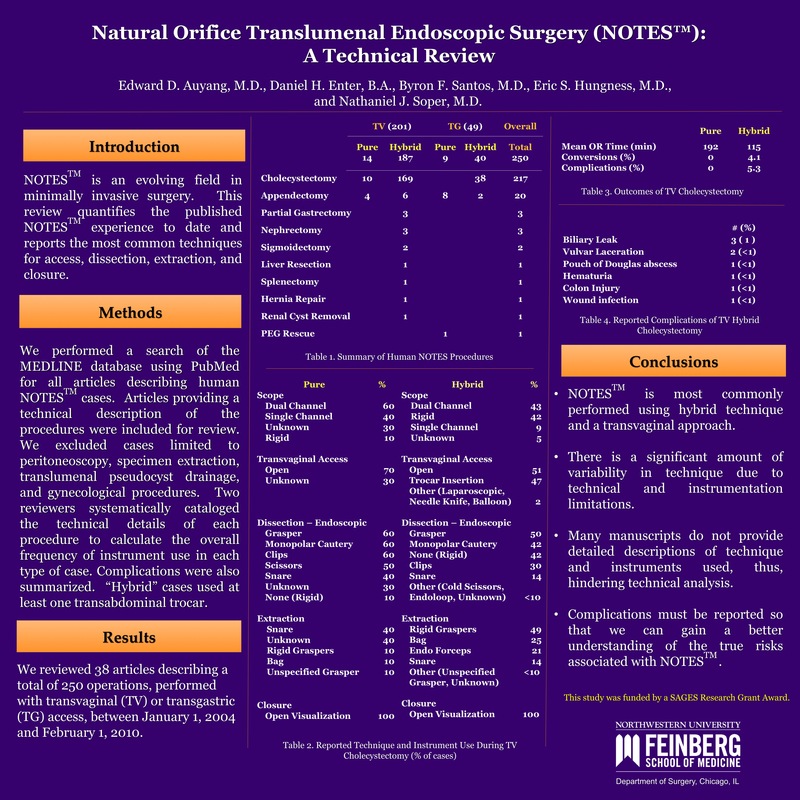 Results: We reviewed 39 articles describing a total of 203 operations (table), performed with transvaginal (TV) or transgastric (TG) access, between January 1, 2004 and August 31, 2009. Access was by open colpotomy or direct trocar insertion in 47% and 46% of TV cases, respectively. Access was by needle knife cautery with balloon dilatation in 95% of TG cases. Rigid scopes were used in 42% of TV procedures. The majority of appendectomies were performed with endoscopic graspers (74%), endoloop (74%), monopolar cautery (63%), and snare (58%). Dissection technique for cholecystectomies was less standardized, with rigid graspers, endoscopic graspers, monopolar cautery, endoscopic clips, snare, and cold scissors being used in 77%, 49%, 41%, 25%, 16%, and 7% of cases respectively. Extraction of specimens was poorly standardized in TV compared to TG procedures, which utilized endoscopic graspers alone. TV procedures had open closure in 98% of cases. In all cases, hybrid TG closure was completed laparoscopically and pure TG closure used endoscopic clips. Conclusion: NOTES is most commonly performed using hybrid technique and a transvaginal approach. While access, dissection during appendectomy, TG extraction, TV closure, and TG closure are the most standardized techniques in NOTES, there is still a significant amount of variability due to technical and instrumentation limitations.